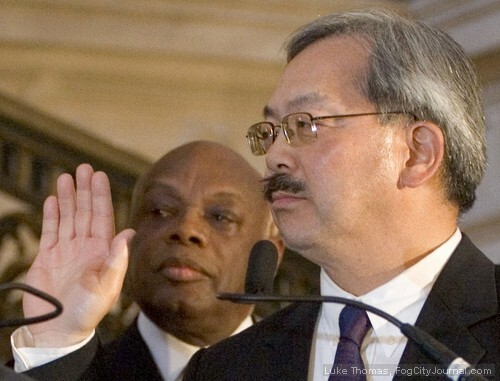 Mayor Ed Lee will decline to accept public financing when he files to run for his own term as mayor on August 8, according to a report in the Chronicle’s Matier and Ross. Meanwhile, the “Run Ed Run” aka “Progress for All” has announced that it closed its operation last week in order to give Mayor Lee breathing room while he decides whether to succumb to their pleas. At the Ethics Commission meeting on Monday, August 8, a staff report on the legal status of the “Progress for All” effort will be reviewed with an apparent intent that the Commissioners adopt the conclusion that the committee should have filed as an effort aimed at helping a specific candidate (progressforallstaffmemo8.3.11-packet). But what so far is unspoken is that the effort to elect Ed Lee has one more option — one worth far more than the $900,000 available through public financing. Moreover, it will create an opportunity for city contractors and others who benefit financially from city decisions to contribute unlimited amounts to an effort to elect Ed Lee. An independent committee will face no restrictions on who can contribute and no limit on the size of the contributions. In the November 2010 supervisors’ contests, independent expenditures played a major role in helping the candidacies of Mark Farrell and Scott Wiener. Thomas Coates contributed more than $200,000 in independent expenditures in that election, and the Alliance for Jobs and Economic Growth spent over $10o,000 in that election. Lee can continue to claim that he knows nothing about any independent expenditure campaign, just as he claimed to know only what he read in the newspapers about the Run Ed Run effort. Lee also claimed to have had no discussions with its backers or leaders despite being regularly pictured with Rose Pak, a key figure in the effort, as well as with former Mayor Willie Brown who has strongly promoted a Lee candidacy. Legally he claimed to have maintained an arm’s distance even while embracing the leaders personally and with grants available from his office. San Francisco’s public financing law currently allows for additional funds for candidates who find themselves facing large independent expenditure campaigns against their candidacy. However, the Ethics Commission has recommended, and Supervisor Farrell has introduced, a revision in the law to deny additional funds to candidates facing independent expenditure campaigns — even for this November’s election. Farrell knows how beneficial such independent expenditures can be if an opponent can’t match it. In one example, one contributor alone wrote checks totalling $50,000. This creates a scenario in which Lee could benefit from unlimited independent expenditures made up of contributions that have no limit — and made by businesses seeking city favors from the incumbent mayor — and the current safeguards for other candidates will have been repealed. It has the potential to make this an election like no other. Next post: City Commissions: No Time for Minutes?